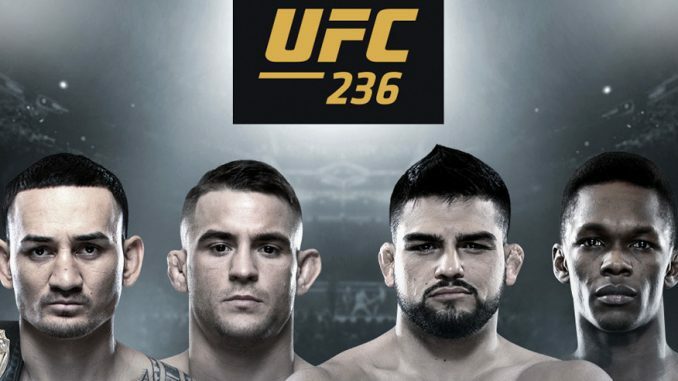 John Pollock's coverage of the UFC 236 pay-per-view from Atlanta featuring Max Holloway vs. Dustin Poirier for the interim lightweight title and Kelvin Gastelum vs, Israel Adesanya for the interim middleweight title. Welcome to our coverage of UFC 236 from the State Farm Arena in Atlanta, Georgia featuring two interim title fights. We will have a UFC 236 POST Show late tonight on the site with Phil Chertok joining me for a complete review of the card. The broadcast team consists of Jon Anik, Joe Rogan, and heavyweight champion Daniel Cormier. This was a great fight. Davis was coming down from featherweight and went through an insane workout regimen to make the weight. He weighed in at 136 pounds and said he was 160 for the fight. Costa was aiming to knock Davis out in the first round landing a big right hand over the top. He was throwing home run shots that Davis withstood. Costa hit a flurry of jabs mixed with a right uppercut, but conversely, had his nose busted open by Davis’ jabs. In the second round, Davis ate a massive shot and came back with a knee to the face, got Costa down to the mat and took his back for the rear-naked choke. It appeared Costa threw everything he had in the first round and Davis absorbed huge strikes but was well-conditioned to withstand it. Max Holloway was interviewed by Megan Olivi and promoted the ESPN+ app, which every champion with pay-per-view points should be doing. Botelho came up from strawweight to make her flyweight debut. She won the first two rounds with improved wrestling than her past UFC fights. Botelho landed a body kick and took Mueller down with a body lock takedown. In the second, each landed a big elbow strike against the cage and Botelho took her down again. Mueller had more remaining in the third, she finally started landing big shots, Botelho went to her back and Mueller entered her guard where her momentum and the fight would end. Everyone had it 29-28 as each round was clear. Jackson won all three rounds. He landed a flush left during a combination in the opening round and lifted Soukhamthath and slammed him to the mat. They had their best exchange in the second round with both throwing everything at each other. In the third, Soukhamthath came back from a low blow and scored the takedown but was immediately reversed into mount. Jackson brutalized his ribs with strikes and took the round and the fight easily. Both were coming off losses earlier this year, Millender last fought on March 9th and returned quickly. The only competitive round was the first. Muhammad used his boxing but suffered a cut by the left eye. Millender used his jab to set up a big right hand. The second and third rounds were dominated by Muhammad with takedowns. Muhammad landed elbows on top and mounted Millender in the third round. I had Muhammad winning 30-26 with a 10-8 round in the third. This went past the top of the hour with the Fight Pass main event finishing on ESPN. Taha came out of the gate with a massive left hook that dropped Salmon. Taha followed with two more shots on the ground for the stoppage. The German Taha lost in his UFC debut last July and bounced back with a big win as the +125 underdog. This was Salmon’s first fight since July 2017 when he won on Dana White’s Tuesday Night Contender Series. The two were former training partners and had a grudge going into this. The first round was detrimental to Imadaev, who grabbed the fence repeatedly as Griffin went for takedowns and led to a point being deducted. Griffin threatened from behind with a neck crank. Imadaev found his rhythm standing with a heavy spinning attack. In the second, Imadaev was taken down several times. Before the round ended, Imadaev started connecting while Griffin was tired. There were big strikes that won it for Imadaev. In the third, it was a very close round, Imadaev was landing with right hands and knee strikes as Griffin responded with a desperation takedown. They had a big exchange to close the round. I had it 28-28 with Griffin having the 10-8 first round with the point deduction. It was a very entertaining fight and was tough to score. Griffin is now 3-4 in the UFC and snapped a two-fight losing streak after dropping fights to Curtis Millender and Thiago Alves by decision. This was Imadaev’s UFC debut and first pro loss. Pantoja is finding his range and connected with a straight right sending Reis down. Pantoja got on top and lit him up with a bunch of strikes before referee Jason Herzog stepped in to stop the fight. Reis took a lot of shots after being dropped. Pantoja is now 5-1 in the UFC’s flyweight division with his third consecutive victory. Reis has lost four of his last five, two of those losses were to Demetrious Johnson and Henry Cejudo. The first round was a fun five minutes as Frevola took Turner down with a single leg and worked from Turner’s back. Turner landed a right hand but was taken down again and Frevola threatened with a mounted guillotine. Frevola’s takedowns were effective and had a strong second round marred by an illegal up kick at the end the round that didn’t result in a point being taken. Frevola’s wrestling continued to be successful in the third and Turner could never dictate with his striking and superior size. Frevola won every round. After winning on Dana White’s Tuesday Night Contender Series last summer, this was Frevola’s first UFC win after a loss to Marco Polo Reyes and a majority draw with Lando Vannata. This was a rematch from March 2014 where Saint Preux submitted Krylov with a Von Flue choke. Saint Preux won the first round with three takedowns but was tiring as the round ended. In the second, Krylov took advantage and landed a right hand and scored his own takedown into full mount. Krylov got the back, flattened Saint Preux and submitted him with a rear-naked choke. It was Krylov’s first win since returning to the UFC following a submission loss to Jan Blachowicz last September. Saint Preux has lost three of his last four and this was his second consecutive loss. This was not a good fight. There was very little striking as each was trying to figure the other out and committed to minimal output. I had Grant narrowly winning the first two rounds and Jouban winning the third. Grant threw a lot of power shots early but would often back up and feint. Jouban scored a takedown in the first and third round but didn’t rely on wrestling in between. Jouban ended the fight strong with his second takedown and some strikes on top. The audience booed the fight. Jouban was furious with the decision but neither guy could be upset with the lack of output and leaving the fight so close. This was one of the best performances and improvements from a fighter in some time. Khalil Rountree came out as a Muay Thai expert with unbelievable leg kicks chopping down Anders in the first round. The kicks were the story of the first round and his striking was the story of Round 2. Rountree proceeded to knock Anders down four times in the second round and yet, Anders continued, and the fight was not stopped. In the third, Rountree continued to chop away at the legs and pick Anders apart with his hands. I felt Round 2 was the rare instance of a 10-7 round and had it 30-25 for Rountree. He looked like an elite level fighter and this performance blew everyone away. Rountree landed 79 significant strikes compared to 19 from Anders. Rountree bounced back after being knocked out by Johnny Walker last November. They announced that former middleweight champion Rich Franklin will be inducted into the UFC Hall of Fame this July as part of the Pioneer Wing. This was one of the best title fights in UFC history. I cannot imagine a fight is going to top this one in 2019. They each scored knockdowns in the first two rounds. Gastelum connected with a right hand and put Adesanya in danger and was throwing bombs with his left hand. Adesanya caught him with a right hand in the second round to send him to canvas and later nailed him with a spinning elbow. They didn’t slow down, Adesanya won the third round with his counters and knee to the body. Gastelum scored a takedown and Adesanya returned to his feet right away. Gastelum came into the fourth round aggressively but it was Adesanya landing body shots. Gastelum turned the tables and rocked Adesanya with a head kick forcing Adesanya to retreat. It was even at 38-38 after four rounds. Adesanya dominated the fifth round following a takedown attempt by Gastelum where Adesanya attempted a standing guillotine and a triangle in an explosive exchange. Adesanya started teeing off and Gastelum was hurt. Adesanya proceeded to drop him three times and landed huge strikes. The fight should have been stopped but it went the distance. I scored it 48-46 with an easy 10-8 for Round 5. Seriously, this was one of the best fights you will ever see, and I cannot imagine any other fight topping it this year. This was another incredible fight one of the best fights this year. Unfortunately, this wasn’t even the best fight on the card. Poirier had an incredible opening round landing approximately 65 significant strikes to Holloway’s 24. He unloaded with a flurry, but Holloway was still standing. Holloway began having issues with his right eye from the strikes. Poirier clipped him in the second round and wobbled Holloway with a right hand as he punctuated the round with a big finish. Holloway returned fire in the third round as he teed off with enormous shots. Poirier tried to shoot to stop the momentum and ate elbows to the side of the head with Holloway taking the round. Holloway went to the body in Round 4 but took a brutal knee to the head that split him open with a nasty cut. Despite of the cut, Holloway still won the round and I had it 38-37 going into the fifth round with a 10-8 opening round for Poirier. Both felt the effects in Round 5 with Poirier putting the better combinations together and neutralizing Holloway against the fence for the final minute to clinch it. I scored it 48-46 for Poirier. The final two fights were among the best back-to-back fights you will ever see and two of the best in 2019. I feel the middleweight title fight will be the fight of the year unless we get another all-time classic.